Thanks to Brooks Simpson for reminding me today is sesquicentennial of emancipation in Missouri. Missouri was the second of two loyal slave states that ended slavery by state action during the Civil War (Maryland ended slavery on Nov. 1, 1864). Kentucky and Delaware refused and slavery didn’t end in those places until the ratification of the 13th Amendment because the four aforementioned loyal slave states had been exempted from the Emancipation Proclamation. We know that January 1865 was an important month in the history of the destruction of slavery in the United States. After all, it was in that month that the House of Representatives joined the Senate in passing the Thirteenth Amendment, which aimed to complete the eradication of chattel slavery in the nation. One of the best Civil War blogs around is Crossroads, written by Brooks Simpson. And one of Brooks’ causes is bedeviling the so-called Heritage community of Neo-Confederates (i.e., people who actually think the Confederacy was a neat thing and its destruction in the Civil War a tragedy). While part of me enjoys watching Brooks needle the Heritage community, sometimes I wonder whether the amount of attention he pays them gives them an importance they don’t deserve. After all, Brooks sits in an endowed chair at Arizona State University and all the Heritage community has are the power of its myths. But then again, maybe Brooks is on to something because certain especially pernicious myths have the potential to do real harm. Like the myth that maybe slavery wasn’t so bad for the slaves, which is asserted by Neo-Confederates. As I have said elsewhere before, I wish people who pushed that vile notion could be transported Twilight Zone-style for a month to live as a slave on an antebellum cotton plantation. Then maybe they’d see the error of their ways. In any case, here’s what Brooks Simpson has to say on this subject. Keep up the good fight, Brooks, but be careful not to give the Heritage community undue attention as you hold their feet to the fire. We’ve all heard it before from defenders of Confederate heritage: slavery wasn’t so bad. Of course, the people who say this are overwhelmingly white people, including descendants of slaveholders (hello, Connie Chastain!). Some people have also decided that anything Charles Barkley says is worth listening to. We in the Phoenix area know differently. Barkley was a talented, personable basketball player who reminded us that he was not a role model, and with good reason. However, Barkley has decided that because he can comment on NBA games, he can use that forum to comment on everything else under the sun, and to do so in a way that fascinates some people and sparks more than its share of eye-rolling and head-shaking responses. The sesquicentennial of the Civil War is now squarely focused on William Tecumseh Sherman’s legendary March to the Sea, in which he led the Army of the Tennessee, the Army of Georgia, and a cavalry division on a grand raid through the heart of Georgia from Atlanta to Savannah that lasted from mid-November to shortly before Christmas 1864. An important focus in the commemoration of this event has been on Sherman’s treatment of Georgia’s population, especially to what extent the activities of his army, particularly in foraging, caused suffering among civilians. With one notable exception, coming from Carole Emberton over at Heather Richardson’s new website, We’re History, the debate of late over civilian suffering from Sherman’s March has focused mostly on Georgia’s white population or been essentially race-blind. Emberton, in her web article, “A Hungry Belly and Freedom,” shifts the focus to how Sherman’s March affected Georgia’s African Americans. She contends that Georgia’s slaves bore the brunt of food shortages created by Sherman’s foraging. They had never been fed terribly well to begin with, Emberton asserts, and years of malnutrition left many slaves on the path of Sherman’s March especially vulnerable to the resulting food scarcity in its wake, resulting in widespread suffering and even death from malnutrition-related causes. The suffering also certainly puts into skeptical perspective Sherman’s subsequently famous and celebrated Special Field Orders, No. 15, issued on January 16, 1865, in which he set aside 400,000 acres of coastal South Carolina, Georgia, and Florida for ex-slaves to subsist on (helping to create the legend of “40 Acres and a Mule” since each family was limited to forty acres and the Union forces supposedly donated some former slaves surplus army mules). The suffering of Georgia’s slaves during the march helps explain this humanitarian gesture as essentially an act of damage control in the press from a general officer not noted for sympathy to African Americans. Still, the incident which no doubt played the greater role in prompting Special Field Orders, No. 15 occurred on December 9, 1864, at Ebenezer Creek, Georgia (please see the image above). If some slaves were starving due to the foraging of Sherman’s men, it did not stop thousands of other slaves from attaching themselves to his army. The presence of some of the slaves was welcome, especially strong, able-bodied men who served in the “pioneer corps” at the front of the columns clearing the army’s way by repairing and building-up roads for heavy wagons, removing obstructions placed by Confederate militia and cavalry that shadowed Sherman’s army, and any other tasks necessary to assisting its forward progress. Various of other slaves made themselves useful in camp and in other roles. On December 9, 1864, as the XIV Corps crossed swollen Ebenezer Creek about twenty miles north of Savannah, Davis acted ruthlessly to detach his army from the approximately 5,000 black refugees who had joined his column. The refugees were kept from crossing the creek until the army had passed over the pontoon bridge, which was then dismantled before the refugees could cross. The black refugees were left to the mercy of Confederate cavalry under Joseph Wheeler, who had been shadowing Sherman’s army throughout the march, much too weak to attack Sherman head on, but able to pick off stragglers and foraging parties that strayed too far from the main columns. Rather than allow themselves to be captured by Wheeler’s cavalry, hundreds of black refugees, mostly women, children, and the elderly, tried to ford Ebenezer Creek, where many drowned. The remainder were captured by the Confederate cavalry and faced an uncertain fate, with no doubt many being returned to slavery. Cut off from communications with the North during the march, news of the incident at Ebenezer Creek initially was slow to spread, but after Sherman’s forces occupied the port of Savannah, Georgia, on December 21, 1864, accounts from appalled eyewitnesses in Davis’ army quickly made their way to the outside world and into the northern press, prompting Secretary of War Edwin M. Stanton himself to travel down to Savannah to investigate, arriving on January 11, 1865. Sherman managed to convince Stanton that Davis had acted properly, and the furor over the incident quickly died away in the glow in the North over the general success of the March to the Sea. Jefferson C. Davis never faced any formal proceedings over Ebenezer Creek and was even later breveted to Major General. It was easy for most white Northerners quickly to forget the incident because from their perspective the victims were only negroes. Especially, with Sherman’s grand if dubious gesture of granting 400,000 acres for recently liberated slaves to occupy five days after Stanton’s arrival (land which would be returned to its original owners months later by Andrew Johnson’s amnesty for ex-Confederates in May 1865). So despite William Tecumseh Sherman’s successful effort at damage control in the northern press and his superiors in Washington, the incident at Ebenezer Creek on December 9, 1864, remains a blot on Sherman’s March and a tragic moment in the history of emancipation in the United States. Hundreds of slaves died so close to final freedom and thousands of others presumably were re-enslaved for a time because one Union corps commander placed questionable military expediency over urgent humanitarian considerations. Of course, this was indicative of the character of the entire march, where many thousands more Georgia slaves suffered hunger, and possibly starved, because the Union Army confiscated food that would have fed them. Still, one cannot help but believe that despite the death and suffering for African Americans from Sherman’s March that for most it was heartening for Georgia’s slaves to see the arrival of the blue columns, for all the suffering their transit caused. The Union soldiers, as elsewhere, were the harbingers that the death of slavery was near and day of jubilee would soon arrive. For if the Confederates could not stop the Sherman’s legions as they marched through Georgia, how could they stop the final collapse of slavery? Sources: 1) http://werehistory.org/hungry-belly-and-freedom/; 2) http://www.historynet.com/betrayal-at-ebenezer-creek.htm; 3) Edmund L. Drago, “How Sherman’s March Through Georgia Affected the Slaves,” Georgia Historical Quarterly 57 (Fall 1973): 361-75. Abraham Lincoln originally had planned for emancipation to begin in the loyal slave states, with slaveholders gradually freeing their slaves over the remainder of the nineteenth century and being compensated with financing provided by the federal government. (And as many ex-slaves as possible then emigrating to some ill-defined tropical destination.) Lincoln tried to sell this plan during the first half of 1862, but because of strong resistance among slaveholders in the loyal states of Delaware, Kentucky, Maryland, and Missouri, formal emancipation began in the Confederate South with the Emancipation Proclamation. The disloyalty of slaveholders gave Lincoln, he believed, the power to free slaves in the rebellious states by decree as a war measure using his powers as commander-in-chief. These powers, he also believed, did not extend to the loyal slave states because they were not in rebellion. If freedom was to come to these states, short a federal constitutional amendment, it would have to come from these states themselves. And on November 1, 1864, Maryland was the first of the loyal slave states to end slavery on its own accord. Getting to that point had not been an easy process. It was given a head start of sorts by the fact Maryland’s slave-based economy had been in decline for decades before the Civil War. Maryland’s farmers long had been making the shift from tobacco, which was suitable for a slave workforce to cereal grains, which were not. The state’s slaveholders had responded to their now surplus workforce either by freeing slaves or (more often) selling them into the internal slave trade (which meant they generally ended up in the cotton states). But a result of the crop shift was that by the eve of the Civil War, the 1860 Census revealed about half of Maryland’s African-American population already was free. What decades of tobacco’s decline had started, the Civil War accelerated by placing pressures on the peculiar institution which Maryland’s slave system found itself unable to cope with. First, Union troops from the free states entered Maryland over the war’s course, often staying in the state for extended periods, and providing protection in their camps from recapture to numerous slaves, often in return for the fugitives acting as temporary servants. Second, when slavery ended in the District of Columbia in Spring 1862, it became a new sanctuary for Maryland slaves, especially after the repeal of the Fugitive Slave Act in June 1864. Third, the advent of black recruitment into the Union army in 1863, led to thousands of slaves leaving their plantations and gaining their freedom in federal ranks. The collective result of these events and the general weakening of state enforcement of slavery brought on by Civil War caused the price of slaves in Maryland to plummet as many owners sought to sell their human property while they still could, but found few buyers. Still, some slaveholders continued to resist emancipation and two important bulwarks of slavery hung on in Maryland, in the southern counties and the Eastern shore. Both areas tended to be away from areas where either Union or Confederate forces routinely operated, and the plantation economy there was as robust as anywhere in the state. Slaveholders also had remained politically powerful in the state, even as slavery was in gradual decline before the Civil War. They had managed to enshrine the peculiar institution into the state’s constitution in 1851, meaning that any state-based effort to end slavery in Maryland would require a new state constitution. The impetus for just such a new constitution came as the Civil War led the political power of the state’s slaveholders to go into decline. The war represented an opportunity for long marginalized anti-slavery forces to assert themselves. Interests that saw Maryland’s future in non-slave-based agriculture and manufacturing, and in growing commercial ties with the North and overseas. With many Maryland Democrats either having gone south to join the Confederacy or their political activities curtailed by Lincoln’s administration and the Union army, which believed Maryland must be held inside the Union by all means, a pro-Union political movement arose in the state during the Civil War under the leadership of future governor, Thomas Swann. It was Swann, who in 1863, pushed the Union party to embrace immediate abolition as a political goal. With the support of the Union party, which dominated Maryland’s politics after 1863, the new state constitution, which included a ban on slavery, was put up to a referendum on October 12-13, 1864. The vote to approve the constitution was close, in an election marked by charges of intimidation and fraud, and the proposed constitution likely would have lost, but for Maryland’s Union soldiers who were allowed to vote in the field and overwhelmingly supported ending slavery. With the referendum narrowly approved it went into effect on November 1, 1864, 15o years ago today. Emancipation: The Destruction of Slave Property? The spring before last I traveled to the hallowed halls of Harvard to be a presenter at a symposium on emancipation in the Civil War and advent of the recruiting of black soldiers into the Union Army. Highlighting the speakers were the stars of this field, including Eric Foner. Among Foner’s comments during his talk at the symposium was to note that emancipation resulted in the destruction of hundreds of millions if not billions of slave property. That is, with the exception of the District of Columbia, slaveholders were never compensated for the loss of their slavery property. Eric Foner’s comment stuck with me for a rather personal reason. In another lifetime it seems, I was a business and economics double major. That is, I was not a History major as an undergraduate and didn’t make the switch to History until graduate school. A bachelor’s in Business Administration requires several accounting courses. And one of the key concepts taught in accounting is assets never really disappear. They always get transformed into something else. This is true as well for capital assets (long existing and expensive productive property), which is why accountants invented the concept of depreciation to account for the diminishing value of capital assets over time as they get “used up.” In double-entry bookkeeping, the diminishing value of a capital asset gets amortized, meaning it gets treated incrementally as an expense over time. The business pays for a capital asset when it buys it, of course, but only recognizes the expense in an accounting sense incrementally over time. Which leads to all sorts of interesting bean-counting games as accountants try to come up with the most advantageous amortization schedule for a business–but that’s a story for some accountant’s blog. In any case, accounting is relevant here because putting the immorality of slavery aside, a slave was a form of capital asset to the slaveholder. And what occurred in emancipation was that hundreds of millions, perhaps billions of dollars of capital assets were suddenly confiscated from their owners. But my point here is that these capital assets were not destroyed as Foner asserted. Certainly, to the slaveholder they were, since the slaveholder no longer enjoyed the value of their slaves. But the asset remained. So who got the value of the slaves in emancipation?–the slaves themselves. The hundreds of millions or billions in slave assets did not disappear but in freedom went to the slaves. So the American South did not see the destruction slave property during the Civil War, but that human property being acquired by the now former human property. This was a just outcome because the whole system of human slavery in the Americas was based on an act of theft to begin with, when the ancestors of these slaves had their lives and bodies in essence taken away from them. An act of theft that was perpetuated across generations as the descendants of the original slaves were themselves enslaved. So emancipation represented the restoration of human capital to its proper owners. “Property” was not destroyed but given back to those persons it should have belonged to from the start. I said something like this rather gratuitously at the start of my talk at Harvard on an entirely different subject. I think Eric Foner was in the room when I said it, but he never said anything about the comment to me. I made the point though and hopefully this small bon mot will make its way into the literature of emancipation in the American Civil War. Slavery was destroyed, but there was no “destruction” of slave property, merely its return to its rightful owners, the slaves themselves. Back in July on a professional trip to New York City, I took the opportunity to visit the new 9/11 Museum and Memorial. In honor of the 13th anniversary of 9/11, here is a re-post of my impressions. 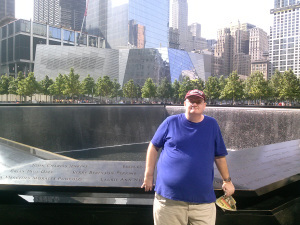 Your humble blogger at the 9/11 Memorial (North Tower pool) on Tuesday, July 22, 2014. The 9/11 Museum is in the far background behind the trees. Every now and then I devote this blog to an off-topic post. This post will be one of them.